How big are the pendants? 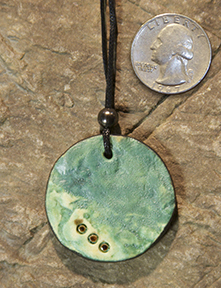 Round pendants are about 13/4 inches in diameter. 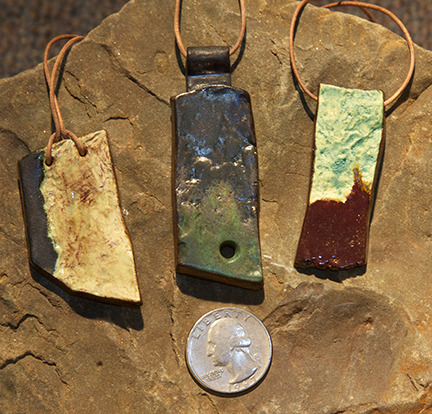 Rectangular pendants are generally 2-3 inches long. The center pendant below is about 3″ long. For reference, a quarter is just slightly under an inch in diameter. Most cords are waxed black nylon or cotton and will be adjustable to around 30″. Sometimes leather or imitation leather is used. Descriptions will indicate cord material and length. Necklace closures are either adjustable slip-knots, or claw-style closures. Some have adjustable chain closures.